Graff has a way of expressing the monumental in miniature form. 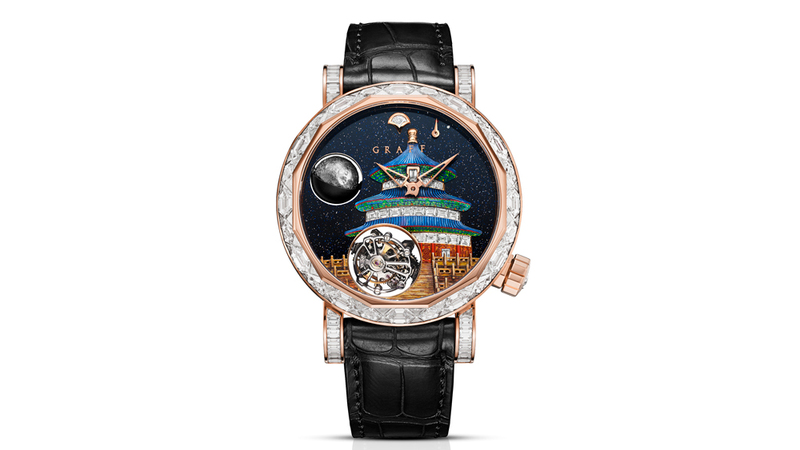 Undeterred by a mere 48mm canvas—one that is already occupied by a double-axis tourbillon and a marble-sized 3D moon—Graff depicts the Great Wall of China, the three-tiered Temple of Heaven and the universe itself on the dials of new GyroGraffs introduced at Baselworld last month. Scaling down the cosmos or one of the world’s seven wonders to mere millimetres is no small feat. These multi-layered watches are anything but ultra-slim at 17.25mm-thick—the invisible setting alone requires a metal layer of mesh grid under the girdle of the diamonds—though the faceted case design, meant to resemble the facets of a diamond, reduces some of the visual thickness. The GyroGraff was introduced in 2014 to showcase its complicated movement along with high-level metiers, including detailed hand-engraving, miniature painting and gem-setting. Previous GyroGraffs have illustrated the Shanghai skyline, a map of the world from space, and a motor speedway from behind the wheel of a racing car. The bezel is an example of Graff’s next-level gem-setting capabilities. Instead of being lined up like soldiers along the bezel, in the conventional watchmaking style, the gems are set mosaic-style using baguettes cut precisely into diamond and half-diamond shapes and fitted precisely flush in an invisible setting. Graff is primarily a jewellery company with mine-to-market capability. It has a stake in diamond mines in Lesotho and Botswana, as well as controlling interest in the South African Diamond Corporation. For its jewellery and watches, Graff custom cuts its own diamonds from the rough, and its watches are often lavishly set with diamonds—some with upwards of 100 carats. This expertise has carried over to the brand’s watches, which it started making in 2008. Graff has also created several of its own calibres with some of Switzerland’s most prestigious boutique movement makers—the GyroGraff was developed in partnership with MHC, a Swiss complications specialist. It is a manual-wound, double-axis tourbillon with moon phase and power reserve. The marble-sized spherical moon is hand-carved with a true-to-life map of lunar craters. A black cover rotates over the sphere to indicate the current moon phase. The hands are small and skeletonized so as not to interfere with the composition.